I've used the running analogy throughout this challenge. At this point we're in the zone - your breathing and your gait is automatic. You've adjusted your pace for fatigue, refreshed yourself with snacks so that you have energy to finish, and you just run. 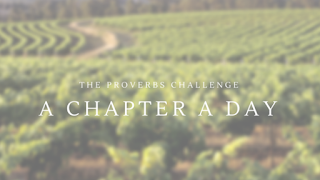 So it is with Proverbs - we've adjusted, refreshed and now we read. I've taken to calling my observations and highlights gems because that's what they are - priceless, invaluable, bits of information. When you sit to eat with a ruler.....(v1-3) When we were growing up my mother sat us down for etiquette lessons, so that we would know how to dine with dignitaries. These verses don't provide details around place settings but they do tell you how to behave when you dine with important people - rulers and kings. Because you won't receive what you typically eat, don't be a glutton. Eat in a considerate manner; observe what is before you and act honored to be there. Do not wear yourself out to get rich....(v4-5) In an effort to have an abundance of material things, some will do anything. Getting rich should not be your primary focus. It's not worth it; in the end, they are all things, which can disappear overnight or whose worth can be devalued. Do not eat the food of a begrudging host....(v6-9) When a person does things grudgingly, it’s out of compulsion, reluctantly or unwillingly, but not necessarily a desire to please. This gives off a feeling of awkwardness and it's almost better that you not take what is being offered. As a hostess, be a generous, sincere, compassionate host. Remove not the old landmark....(v10-11) Don't try to defraud the fatherless or the helpless among you. They appear fatherless, but God will take care of them. Don't take advantage of anyone. Finally, we see the effects of alcohol. Who has woe? Who has sorrow? Who has strife? Who has complaints? Who has needless bruises? Who has bloodshot eyes? Those who linger over wine.....(v19-25) Bloodshot eyes, bruises (due to fights or stumbling), the burning sensation in the stomach, no self-control, seeing things, imaginations, not being in full control of your mind and body, sadness, being delusional, and at the end wanting more. These verses describe a vicious cycle, which may be hard to break once started. We are constantly being challenged to be wise in all our ways. Read on. I'd love to hear your thoughts.